The gúta is a gigantic troll-like species found on Reach. The gúta is the largest terrestrial lifeform ever discovered on Reach, at nearly twenty feet tall. Severe aggression from gúta is rare, apart from rutting males or females with young. Even so, it is an extremely dangerous animal. The gúta is nearly hairless, with scaled skin and sharp teeth. The species has tusks extruding from either side of its jaw. Gúta have two toes on each foot and three fingers on each hand, with an extremely sharp, long claw on each digit. Although gúta are capable of moving bipedally, they will use their arms for support while running. The species may have been rendered extinct due to the glassing of Reach, although it is possible that some were evacuated to preserve Reach's wildlife, or that some existed offworld already. It is remarkably durable, requiring three to four shotgun blasts and an equal number of melee attacks to kill it on Normal difficulty. Plasma grenades, however, are very effective against them, usually granting a one-hit kill. [verification needed] They can also survive up to three direct hits from a Hunter's cannon. 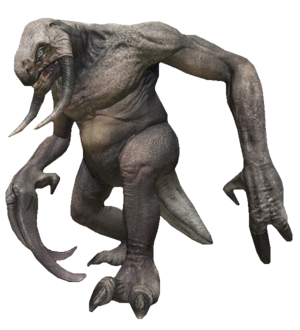 A creature that looks very similar to a gúta, albeit a much smaller one than depicted in Halo: Reach, is indigenous to Minab. The gúta has a slight resemblance to the Deathclaw from the Fallout series and slightly resembles the rancor of the Star Wars universe. The gúta is seemingly named after the guta, a fearsome demon from Hungarian mythology, as many of Reach's early settlers were of Hungarian descent. A gúta's roar can push a Spartan back fairly hard despite the enormous weight of a Spartan clad in MJOLNIR armor. On a player's career stats at Bungie.net and Halo Waypoint, the gúta is listed as "mule". Instead listing a rank, the entry simply says, "No hugging". The "Mule" nickname is an internal name used by Bungie employees. Unlike killing Moa, killing a gúta awards points in campaign scoring due to the creatures being a threat to the player. Several ideas were formed around the gúta, but were ultimately cut from the game. Among these ideas were gúta being used as battle-mounts by Sangheili and Unggoy, gúta that were equipped with mounted weapons, and the ability for the player to "hijack" the Gúta and plant a grenade in its mouth. The gúta was originally set to be in several campaign missions in addition to Nightfall. Due to resource constraints, this level features the only two gúta found in the game. The player can move a dead gúta's body around by attempting to walk over it, as a gúta's body is considered solid in the game's physics engine, unlike all other bodies in the game. Early designs of the gúta. Concept art featuring two Kig-Yar riding a gúta. Concept art of a gúta killing an Unggoy. Concept art of a gúta fighting Unggoy. SPARTAN-B312 and Jun-A266 encounter a gúta in the campaign mission Nightfall. SPARTAN-B312 observes a dead gúta.